So much is written recently about the US electric power grid, and so much of what is written is simply wrong, mistaken, or lies. Or, to paraphrase our late President Reagan, "The trouble with our . . . friends is not that they're ignorant; it's just that they know so much that isn't so." This article explores the rather interesting world of grid-scale electric power generation, with a focus on the US grid. The power sources are changing and have changed over the past decade, with wind turbines and solar power plants increasing in the share of power produced into the grid. The increase of the renewable energy forms (wind and solar, but also others) causes great anxiety among some pundits, who take pen in hand and apply it to paper (or the digital age equivalent), often without doing much research (if any) or giving the matter much thought (if any of that, either). Much of the data in this article is from the US Energy Information Agency and various reports on Electricity produced by them. Wind energy data is from various sources including the American Wind Energy Association. Nuclear plant capacity factors are from the Nuclear Energy Institute. First, who am I and why do I feel qualified to write on such a topic? I am a chemical engineer by education with 40 years experience world-wide, and have been a licensed attorney-at-law in California for almost a decade. Chemical engineers such as me are very concerned with the energy, including electricity, that feeds into our chemical plants, refineries, and petrochemical plants. We routinely assess various options including whether it is best to purchase electricity from a utility grid, self-generate, or find some (hopefully optimal) combination of each. This is a normal part of chemical engineering, and is not limited to energy. We also assess raw materials, intermediate feedstocks, and other aspects of chemical manufacturing for make-or-buy, also sell-or-process decisions. It is important to know how a utility grid functions, what drives the economics, and what future developments are likely to occur. One of the facts about utility-scale generation plants is the capacity factor, the annual actual output divided by the maximum possible output if the plant ran at 100 percent of nameplate capacity every minute of every day for the entire year. What is frequently, and wrongly, stated by nuclear power proponents (cheerleaders as I refer to them) is nuclear plants run at 100 percent output. Note that no amount of repeating a lie will change the lie from false to true. 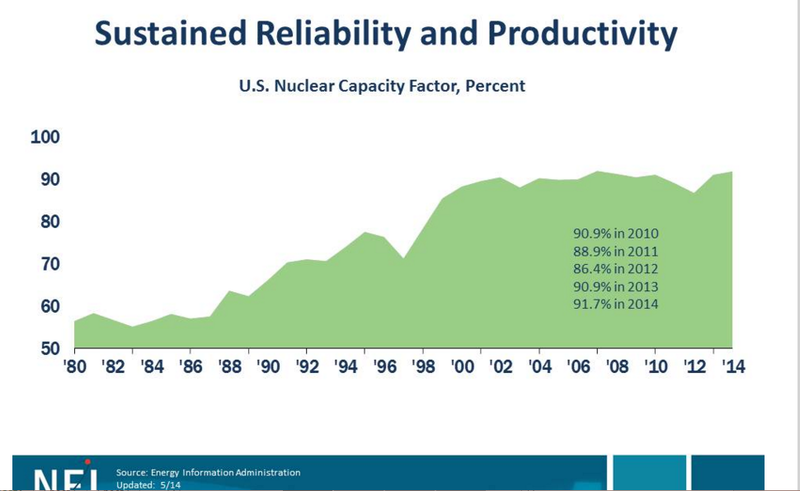 From Figure 1, it can be seen that US nuclear plants ran with less than 60 percent capacity factors for many years, until about 1988, and have only reached the low 90 percent range since the past 15 years, approximately. The figure for 2014 is barely over 92 percent for the 98 reactors still running. Another false statement by anti-wind writers is that wind energy has only a 25 percent capacity factor. Yet, the annual average for 2014 was 33.9 percent (rounded to 34 in Figure 2). The EIA data for monthly wind energy output shows a seasonal shift, with maximum output in April with a 43 percent capacity factor. The wind dies down in the Summer, with August having the minimum output and a capacity factor of 22 percent. 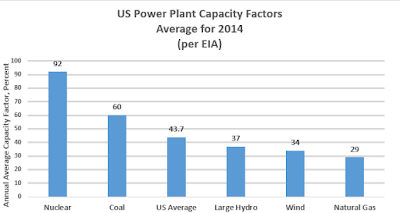 Another truth from Figure 2 is the US average capacity factor for all power plants on the grid was 43.7 percent. This is based on EIA data, which shows an installed power generation capacity of just over 1 million MW (1.067 million MW), and annual electricity generation of just barely more than 4 billion MWh of electricty, both figures for the year 2015. Other forms of generation shown in Figure 2 are coal plants at 60 percent capacity factor, large hydroelectric plants at 37 percent capacity factor, and the lowest of all, natural gas power plants at 29 percent capacity factor. The fact is that the wind-energy detractors shout from the rooftops that wind is bad because the capacity factor is so low (even though they are wrong about the number, as shown above). Why, then, are these same detractors not equally outraged over the even-lower capacity factor of the natural gas power plants? If capacity factor was a problem, then clearly natural gas power is less than wind, less than large hydroelectric, and should be banned. The answer, of course, is that the demand on the electrical grid varies from a low at night to a peak in the day. To meet the demand in the day, but not produce too much at night, much of the natural gas power must be idled at night. Also, seasonal peaks occur with some grids having a higher daytime peak in the summer due to air conditioning loads, while other geographical areas have a daytime peak in the winter from heating loads. Some of the peak loads are met by running simple-cycle gas turbine plants, or peaker plants. These plants typically have low efficiency and are run as little as possible. When wind energy wanes as the wind velocity decreases, natural gas power plants are typically the ones chosen to increase output and meet the grid demand. Natural gas power plants are ideally suited for load changing, in great contrast to nuclear power plants that refuse to change their output even at night when demand is low and no one needs their power. A final comment about the need for backup. As noted above, the nuclear cheerleaders are quite wrong (deliberately lying, perhaps?) that nuclear plants run at 100 percent. When, not if, the nuclear plants are shut down, the grid must have other power generation plants increase output, or startup. The same is true for coal powered plants. They, too, shut down at times for repairs or maintenance. Also, natural gas power plants must shut down at times for repairs and maintenance. Where hydroelectric power exists on the grid, typically several turbines with one generator each exist. When a water turbine is taken offline for repairs or maintenance, its output also must be compensated for by other power plants on the grid. Why, then, do the wind energy detractors make so much fuss over wind turbines also requiring backup when the wind does not blow, or mechanical issues require attention? It appears that the answer to the anti-wind energy lies in the area of government subsidies for wind power systems. Yet, in the US, new nuclear power plants enjoy a federal subsidy of $15 per MWh produced, very similar to that for new wind-energy power. Using actual data, it is shown that wind energy has a monthly capacity factor in the US that ranges from 43 to 22 percent, with the annual average of 33.9 percent. It is also shown that nuclear plants do not run at 100 percent capacity factor, but achieved barely more than 90 percent in the past decade. Earlier decades had nuclear plants running at barely more than 50 percent capacity factor. The annual average capacity factor for all power plants on the US grid is but 43.7 percent. Nuclear Power Plant is still top power producers in America. However, there are still risk while in operation because of possible radiation leak or nuclear explosion. Aside from that it can cause of climate change. However nuclear power plant is still best sustainable power generation. "Nuclear Power Plant is still top power producers in America." -- No, nuclear power provides just under 20 percent of electricity in the US, in third place behind coal, and natural gas. "However, there are still risk while in operation because of possible radiation leak or nuclear explosion." -- Yes, many nuclear plants have radiation leaks, and the Three Mile Island Unit 1 reactor had a partial melt-down that also released radiation. The SONGS nuclear plant near San Diego also sent radioactive steam into the sky before it was permanently shut down. However, nuclear explosion is not possible with commercial power plants. "Aside from that it can cause of climate change." -- Nuclear plants do not, to the best of my knowledge, cause climate change. The do, however, heat up a substantial amount of water in the reactor cooling and turbine exhaust steam condensing processes. The water vapor from a cooling tower acts as a greenhouse gas and increases the local humidity. "However nuclear power plant is still best sustainable power generation." -- No, nuclear power is not sustainable nor will it ever be. Professor Derek Abbot of Australia published 15 reasons that nuclear power is not sustainable and the world should never rely on nuclear for the long-term. One of the greatest reasons is that steel from reactors and other parts that are bombarded by nuclear radiation lose their strength and it is not possible to recycle that steel.